A recent review of Nick Maxwell’s book – founder of Friends of Wisdom – met with them in London last month – and my comments interwoven. 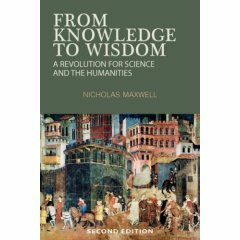 Nick Maxwell’s recently republished book – “From Knowledge to Wisdom” – may be reaching its time. First published a quarter century ago, it got many good reviews. But its ideas didn’t “go” much of anywhere in terms of thinking or practice; a palliative with little action; a “feel-good” approach which we could ignore until…right now – says Nick. As the book takes us from several century old ideas of knowledge to the “needs” of the current era, Nick guides us through the history of thought which has dominated (philosophical) knowledge then and endures to the present moment: what is the universe, how do we study it, how do we know, what is truth? We have come far, in many senses, but now seem to be at some impasses. He urges us to rethink where we are, how we got here, and the deep necessity to broaden our explorations toward (philosophical) wisdom, rather than being bound to particular and narrow historical ideas of what knowledge consists in. Wisdom is the perspective that how we go about thinking and pursuing knowledge must include its effects on and implications for the human condition. In so many senses, knowledge has “overstepped” itself, and has endangered our very existence: e.g., the blights of the 20th century – holocausts, atomic bomb, GMO’s, and so much more. As important, we have paid very little attention to the questions about what is good in life, and how our pursuits of knowledge should help enable us to make the human condition good, better, and inclusive of all persons. The Enlightenment philosophes took their ideas to be correct thence (ultimate) solutions to the socially problematic. But their ideas which dominate philosophical and scientific thought and practice to this day, are not correct. Nick’s arguments run broad and deep: he analyses how our universities have been dominated by the quite successful attempts of the Enlightenment philosophes (Bacon-Newton-Enlightenment philosophy of knowledge) to detail and effectively confine knowledge as it was developed by the thinkers who led to that time. Then he argues that this dominating approach to knowledge is both very narrow and particular, and it does not much take into account the effects of knowledge and its “products.” It demands a particular notion of rationality, and a pervasive sense of unity in thought and practice. And it was not only science as a central focus of knowledge, which carries this history to its work: the idea that scientific explorations would ultimately “benefit” us. From these ideas, there developed the parallel sense that the good world of science would lead to the social benefit of the social sciences. But all this remains little analyzed or criticized in the contexts of wisdom. Here, this reviewer deeply agrees with the thesis of the book, and should point out that my reading of knowledge and wisdom seems to be very similar to Nick’s. The notion that the Social Sciences would and should lead to a “good life,” is widely assumed. But the reality has fallen far short of its assumptions and hopes, or led us on paths which are narrow. I would point out, however, the works of [my] school of Anthropology led by Franz Boas whose students went out into the entire world – demonstrated that all human languages all are of the same order, that their cultures may differ for various histories and reasons, but that all humans are pretty much alike. This work led to the UNESCO statement on Race in 1946, and contributed much to the U.N. Human Rights Declaration of 1948. This work remains in the contexts of philosophical wisdom – certainly as Nick Maxwell embraces them. It surely helps inform my positive assessments of “From Knowledge to Wisdom,” and reading this book has been a continuing lesson in framing my own work and thought. Nick is very “encyclopedic” in this book: he explores, then assesses and refutes each perspective – leading, of course, to the necessity for the perspective of wisdom in our thinking and work. Titles of the early chapters, pretty much in order, reveal and describe the outlines of his thinking, though his analysis is systematic and more than ample in its details. The book sets the stage in Chapter One: “Human Suffering and the Need for a Comprehensive Intellectual Revolution.” The enduring claim to the rationality of philosophical knowledge which would “enhance the quality of human life,” is actually profoundly and damagingly irrational, unrigorous. We need to think and act in new ways…beginning right now. Rational thought – rightly constructed – will lead to wisdom, not mere knowledge in the Enlightenment senses. But truth – the very concept of truth – depends on much a priori knowledge, and…and we go back in time to questions of what and how we know; and what is the nature of truth. All this rises to question in these times, as Nick wonders about the concepts of the a priori and how necessary it is to consider the world to be fixedly mechanistic, continuous. After much thought, he will want to rethink the very nature of the rational, and the very underpinnings of rationality. The analysis proceeds systematically through the next four chapters, as Nick presents the critical (always!) exploration of the Philosophy of Knowledge, presents The Basic Objection to that, then the Philosophy of Wisdom, which is reframed into what he calls “Aim Oriented Rationality;” completing his critical expositions. While I can’t claim to judge his critical expositions deeply within the contexts of the Philosophy of Science, my considerable experiences with philosophers and historians of science (and technology) are quite congenial, at least parallel, with Nick’s. Their focus is particular, narrow, and does not seem to leave much open for discussion. In the end, the book lays out a critical exposition of a “new” sort, of “refined” ideas of rationality, and how we might go next in expanding our thinking about thinking. Nick wonders if the kinds of change he explores – toward philosophical wisdom – might come more from the social sciences than from the Philosophers of Science. Here, I want to portray my own positions from which I have been reading/studying this book. As I deal with Boas’ ideas of anthropology: culture, language, physical anthropology – in which we have to observe all the world’s peoples – one is faced with more ancient and somewhat different senses of the history of ideas. And my background flows also from the ideas of Pragmatists – especially Dewey and Mead – whose ideas of the human include the notion that we are in social interaction with others. The “self” emerges from a relationship with an infant’s m/other (now included under the rubric of “Attachment Theory” in developmental psychology). The very concept of who and what we are, changes considerably, and will continue to embrace a philosophy of wisdom. As Dewey and Mead attempted to “get beyond or around” dualism, we no longer deal with ideas from the past several centuries. Instead we are taken back to the Greeks whose ideas continue to dominate ours in many senses. Here, I wonder – in considering —Protagoras, that man is the measure, what is the nature of the “measurer.” In examining the human body, beginning with one’s/my own – I find that much has been neglected. The body, which is totally “obvious” in Dewey’s lament, continues to be dominated by the Homunculus theory, recently encapsulated by the new ability to envision the “workings” of the brain. So the battles between Heraclitus vs. Parmenides, Pythagoras, Plato, resituated somewhat in Aristotle’s still dominating ideas, resonate loudly in rethinking the human: the one who (whose body) is capable of observing “objectively” No small task: how do we do that? Faces – above all – the fact that we live and move “out-of-balance” complicates our bodily being, and asks how to wonder how we are, become, live both is and as change and permanence. Here we have taken the ideas of Descartes – flowing from Plato, especially – to captivate the dualisms of mind and body as being an “accurate” depiction of the human. To examine the world, it seems primary to examine the measurer – and to ask which is us…then which is the world. Thus, my viewing of wisdom – possibly less the philosophy of wisdom – than expanding the practice of observing oneself observing, calls for us to devote increasing thought to the nature of the human. Where are we, how did we get here, how do we “move forward” in this global moment in inclusive manners? Less, in my thinking, as an homage to our forebears; more to pursue the thinking which has led us here – toward being able to transcend our own thinking. We must walk with more than idolize the thinkers and prophets of all of time and places. Toward wisdom. The challenge: how to help create a good and meaningful life and attempt to include all persons now and toward the future? These are some of lessons, confirmations, rethinkings which “From Knowledge to Wisdom” has inspired in my life and work. Toward wisdom as we live and experience ourselves and the world. Thank you Nick Maxwell. Whenever I hear that “all human languages all are of the same order, that their cultures may differ for various histories and reasons, but that all humans are pretty much alike,” I wonder why all these “alike” humans look so different. Looks are just what the “anthropological” perspective was supposed to transcend, but before we transcend it, maybe the look is worth a second look. Tutsis are about twice as tall as Hutus, and the difference is so pervasive that when the radio screamed “Chop the tall trees,” all the Hutus knew who to kill. But somehow this huge change in gross anatomy left the fine structure of the brain absolutely identical! We’re all the same! Tall and short don’t mean a thing! There are some problems involved with extending this approach to other species. My friend’s Golden Retriever jumped in the pond as soon as he saw it, and started retrieving anything that floats without a hint of training, but if I throw a chihuahua off the dock, it won’t even float itself, much less retrieve anything. A species is nothing but a population that can inter-breed, so some constraints apply to the naughty parts, but for the rest of the anatomy, identity is just a pleasant fiction. An interesting nutshell about the paradox of surface difference but deeper similarity is this: tall or small we all have mothers, and tall or small we all have some parental beings that we are very close to and/or have issues with that affect us deeply. We talk about this, make decisions based on this, write about this, make plays, movies, songs, and it affects every dimension of our lives. Our developmental and social human nature shares this dynamic, regardless of physical form factors. Being and awareness is larger than just form factors– tall or small one’s mother or father often always remain much larger than we are at any time. And this is just one example of the many similar social human dynamics. I wonder if this is more the point of what Harvey has been writing about and connecting with in terms of others who are working at looking how we are here and now, in all our stages and modes of sociality. Being more critical of what is considered ordinary and out of awareness, than what is exotic and extreme seeming. Daniel: Chihuahuas and Golden Retrievers all have mommies and daddies, too, but chihuahuas still can’t swim, and Golden Retrievers will never find any tacos in the pond. Harvey: I have tried to imagine the possibility of evidence that “all human languages all are of the same order.” Order of what? Compared to what? If you posit equality, what sense can it make to talk about order? The equivalence of human languages is one of those “pleasant fictions” that conforms so beautifully to so many liberal prejudices that the very idea of testing it arouses an intense disgust in the minds of most academic hoodoos. Hi Jacob- Well what’s clear is that there is just a paradox or conflict here: authoritarian worldviews that see progressive and nurturing dynamics as simplistic or not worth examining, and progressive worldviews that see rules based mainly on the physical or behavioral as simplistic or even misleading. About the premise of your comparison, the only human comparable to the breeding of dogs is– eugenics. This line of thought is ethically questionable and some would say supports a racialist view of human nature. I don’t think this is what you are driving at. Perhaps the conversation would open up more if a better comparable was used. Harvey, aren’t you talking about more than imagining and ideas here… aren’t you talking about wisdom coming from pragmatic empirical and cultural research on human nature, like the face, emotions, kinesics, non-verbal communication in general, infant development, renewing the practice of descriptive linguistics, (and more)… all this as a basis to renew our definition of human nature– based on study and observation, not on imaginings and ideas separated from actuality; questioning what’s axiomatic and renewing ontology? Larger question: What is the human, human nature? Begin: two kinds, female and male – how different, the same? Different peoples, cultures, languages, appearances/bodies – not all that different. and we change a great deal: How do we get to look like we do? – face and appearance is much about use of muscles – English speakers look different than their cousins who live elsewhere. We humans are interacting creatures! Child learns language and the world as a study in its m/other – then emerges as a self. Many new ideas here, flowing from the ideas of G.H. Mead – and we are always in change. To concentrate on the fixed properties of humans is to fall – as Dan Latorre says – into the ideas of fixity and eugenics which take observations and turns them into politics. More coming up soon – about why different looking persons look different – and how our “looking back” at them can shape their appearances. Is there any evidence that all human languages are equivalent? But where did this Daniel Latorre come from, with his pronouncements about which “line of thought is ethically questionable?” Are you preparing them for careers in the thought police now, Harvey? Hi Jacob, I’m a former student of Harvey’s and editor of this site so I’m pretty much just about helping grow this site for those interested in Harvey’s work. I do this in my spare time for free so I don’t have much of any agenda other than working to help Harvey’s blog become an interesting place to connect with people. We’re trying to encourage some good conversation on this site and my reply in this thread was just challenging your eugenic based example and asking for a clarification that is more apt for the topic at hand to this blog post. Just because people disagree or are challenging doesn’t mean it has anything to do with some hidden Orwellian vibe on this blog, quite the opposite in fact. Orwell loved to be clear about language. This site is for open discussion and questioning, as we should be in this day and age of rapid cultural change; anyone can join in as long as they follow basic netiquette.